Are you one of the millions of Facebook users thinking, “I’m on Facebook, now what?” In this free course, you will learn how to: customize your profile, create life event posts, work with photo albums, chat with friends, and use Facebook groups. To take this course, you’ll need a Facebook account and know how to post – or have taken our first course called “Introduction to Facebook”. 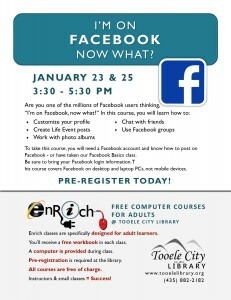 This course covers Facebook as found on desktop and laptop PC’s – not mobile devices.